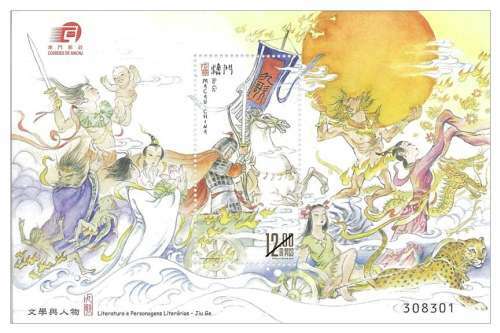 Stamp Issue "Literature and its Characters – Jiu Ge"
Qu Yuan was a great Chinese poet. 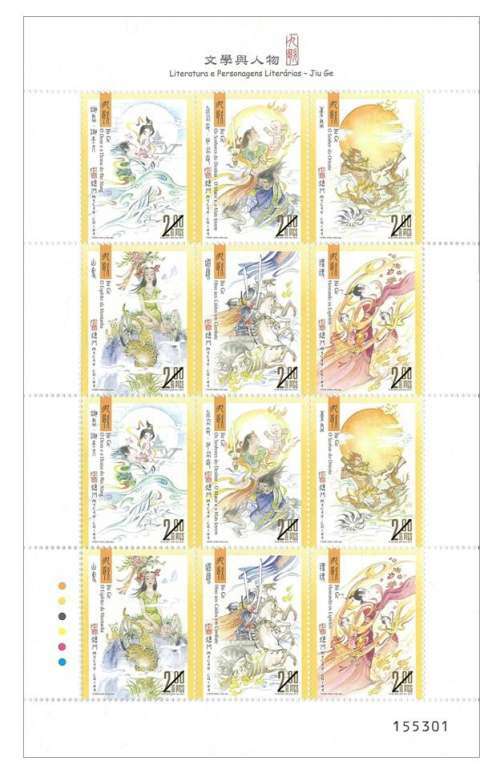 His surviving work “Chu Ci” (Songs of Chu) is divided into 25 chapters that includes “Li Sao” (The Lament), “Jiu Ge” (Nine Songs), “Jiu Zhang” (Nine Declarations), and “Tian Wen” (Questions for Heaven), etc. 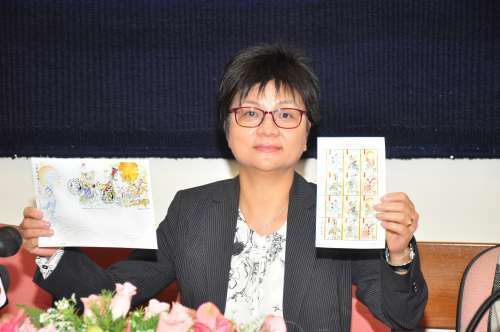 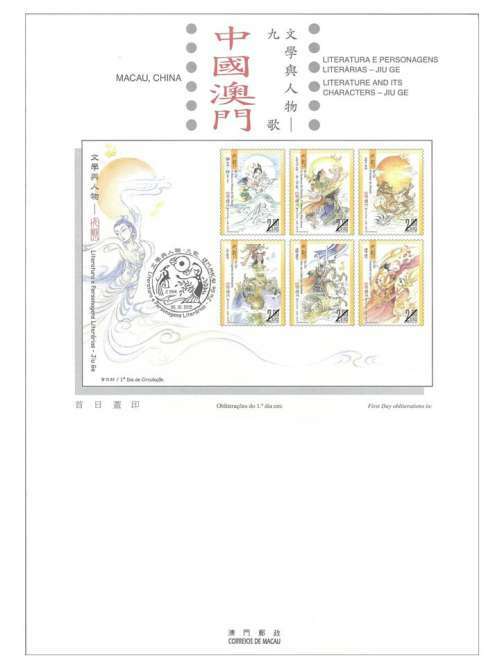 Following the same series “Li Sao”, the stamp series Literature and its Characters issued in 2004, Macao Post will release the issue “Literature and its Characters – Jiu Ge” on 30th October, 2015. 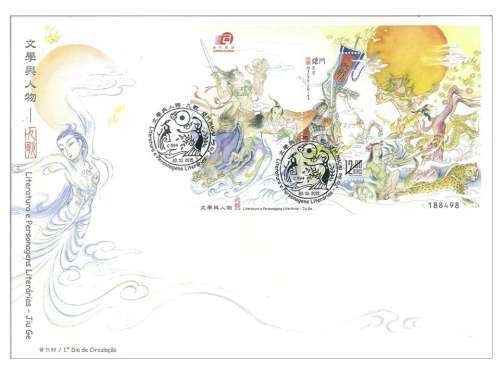 The “Chu Ci – Jiu Ge” is a set of extremely elegant lyric poems composed by Qu Yuan, which is re-composed based on the popular ritualistic songs of the State of Chu with extra artistic work. 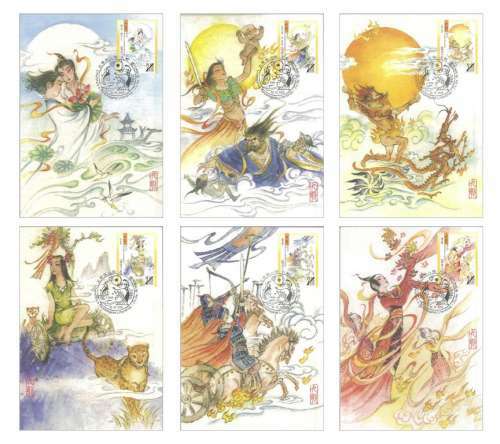 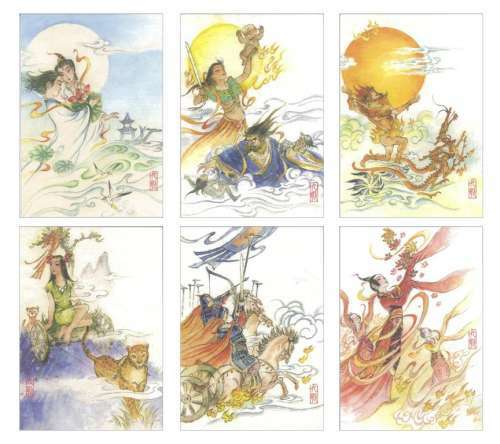 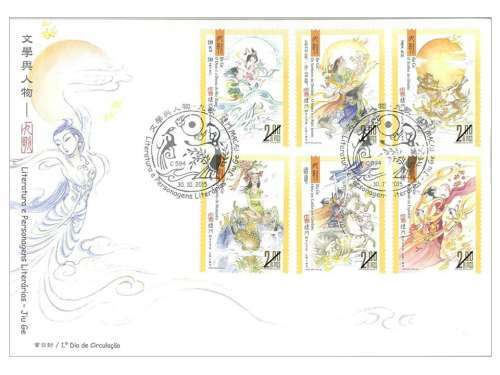 This issue includes a set of six stamps and one souvenir sheet, portrays the classical characters and scenes in Jiu Ge vividly, namely: “The God and the Goddess of River Xiang” – which sings about the sadness and happiness caused by separation and union; “The Lords of Fate – The Greater and the Lesser” – which concerns about the stages of life including Birth, Aging, Sickness and Death; “The Lord of the East” – which was praised respectfully through the magnificent image of the Sun shining on the land, “The Mountain Spirit” – which portrays the image of an enamored lover; “Hymn to the Fallen” – which mourns the heroes of previous generations who sacrificed their lives for the country, and “Honoring the Spirits” – which soothes the deceased, prays for those in the present time and looks forward to the future. 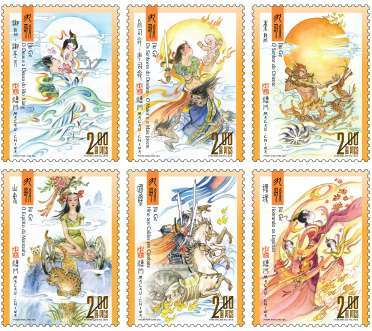 This is the thirteenth theme in 2015. 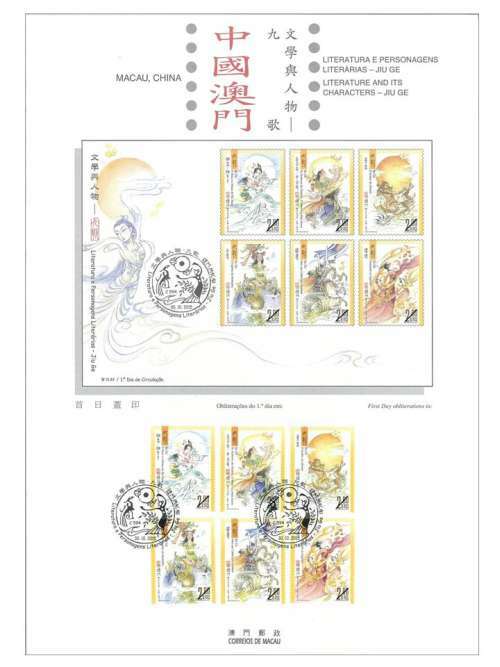 The previous issued stamps are “Lunar Year of the Goat” on 05/01/2015, the label stamp “Lunar Year of the Goat” on 28/01/2015, “110th Anniversary of Rotary International” on 16/02/2015, “Mainland Scenery VI” on 01/03/2015, “25 Years of AICEP” on 27/04/2015, “Macao Wetlands” on 05/05/2015, “110th Anniversary of the Birth of Xian Xinghai” on 13/06/2015, the label stamp “Old Streets and Alleys” on 30/06/2015, “150th Anniversary of Guia Lighthouse” on 08/07/2015, “10th Anniversary of the Historic Centre of Macao as World Heritage” on 15/07/2015, “Water and Life” on 31/07/2015, “70th Anniversary of Victory in the Chinese People’s War of Resistance Against Japan” on 03/09/2015, the definitive stamps “Old Streets and Alleys” on 22/09/2015, and “Festivity” on 09/10/2015. 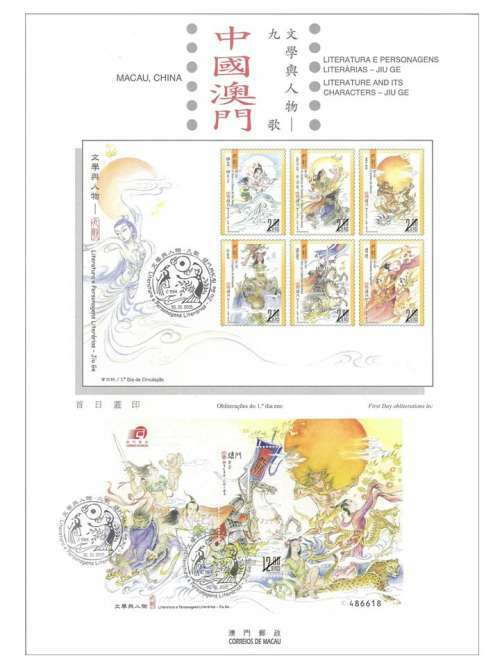 Technical Data of Stamp "LITERATURE AND ITS CHARACTERS – JIU GE"